When I think of a casserole, I think of an oven-baked comfort dish. 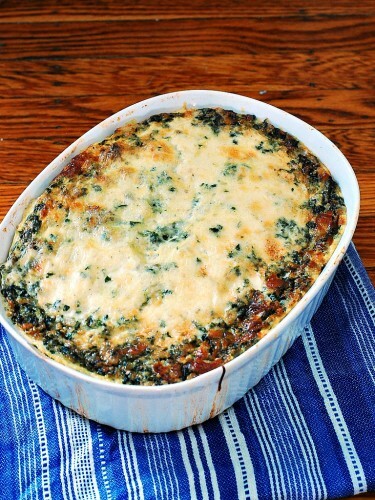 This is a breakfast casserole, with polenta, spinach, sausage and lots of cheese! 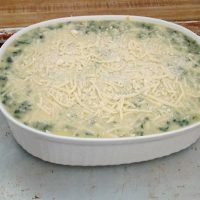 Casserole. How do you define it? I think of a comfort dish baked in a deep oven-to-table dish. It usually has all of the components of a complete meal: protein, veggies (or fruit) and carbs. Most casseroles that I think of can also be made ahead and frozen (or baked and reheated). They are great for make-ahead meals for yourself, or to bring to someone who is ill or just had a baby. I love breakfast casseroles for holidays. For one thing, they’re different from your regular-day breakfast. The second reason is that by making them ahead, you can just pop them in the oven in the morning. Who wants to wake up early on a holiday and slave over breakfast? 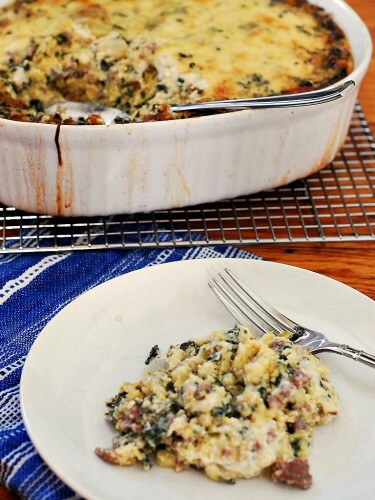 This casserole is full of flavorful breakfast sausage, spinach, and polenta (cornmeal). Plus cheese. Lots of cheese. All the food groups are represented. I prepped this casserole and put it straight into the oven, but you could assemble it (up to pouring all of the ingredients into the casserole dish) and refrigerate it. Or bake it, cool it, refrigerate it and reheat it. 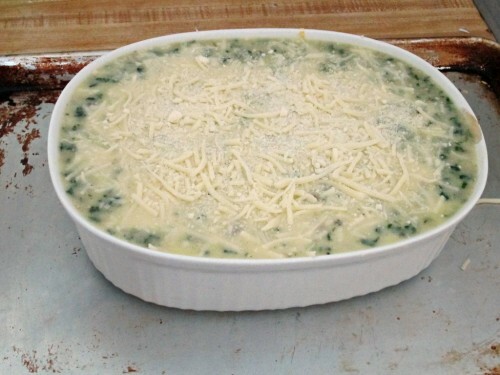 Use the 1 tbsp of butter to grease the bottom and sides of a 1.5- to 2-quart casserole dish. Set aside on a sheet pan. Preheat the oven to 350 degrees if baking right away. In a large skillet, cook the breakfast sausage over medium heat, breaking it up as it cooks, until no longer pink. Add the diced onion to the skillet, and cook for about 2 to 3 minutes, until onion is softened. Remove the skillet from the heat and add the spinach. Stir to break up the clumps of spinach. Set skillet aside. In a large mixing bowl, beat the 4 eggs until uniform. Whisk in the milk and the water. Stir in the polenta, 1 cup of the mozzarella, and the salt and pepper. Add the sausage mixture to the mixing bowl and stir to combine. Pour the contents of the mixing bowl into the casserole dish. Toss together the remaining cup of mozzarella and the Parmesan. Sprinkle over top of the casserole dish and place the casserole, on the sheet pan, in the oven. Bake for 45 to 60 minutes, until the polenta is firm and a knife inserted in the casserole comes out clean. Don’t forget to check out the other #SundaySupper casseroles! Nothing more comforting than a cheesy breakfast casserole! Yours looks delish, Coleen! Oh this looks fantastic for a lazy Sunday brunch! What a gorgeous breakfast casserole. I could easily make this vegetarian, I’ll definitely have to give it a try. This is an awesome dish for when you have guests! What a cool breakfast idea, thanks for sharing. I would totally have to make this for a big crowd to keep me from eating the whole thing. What a comforting way to start the day!! I really love this! This would make an amazing breakfast for dinner! All my favorite things in a casserole, for my favorite meal of the day! I’m in! This looks and sounds terrific. We don’t eat a lot of polenta here. I think I need to change that starting with this recipe. YUM! Love love love polenta and spinach! This looks so yummy! I love making breakfast casseroles! I make a new one every thanksgiving and Christmas morning! I’ll have to give this one a try! OMG…this looks so good! I think this would even get my hubby to eat his spinach!! You represented the stars of the food groups, Coleen! Stellar casserole =) And, you’re right. Casseroles are indeed a thoughtful present to give those who are ill or care taking newborns. I adore that this is a polenta based breakfast casserole instead of bread or potatoes. I would adore it! What a delicious combination…my family would LOVE this for breakfast! 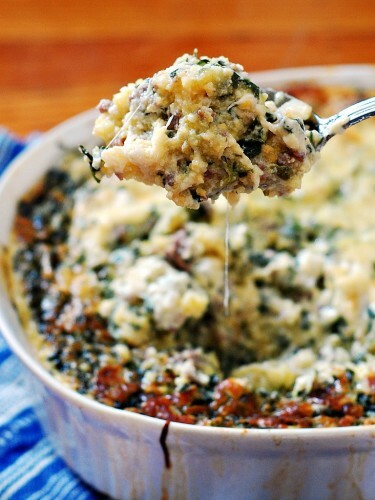 This is one good lookin’ casserole. I’m lovin’ all that cheese. This looks wonderful! Is that 1.5 cups *cooked* polenta, or dry (coarse ground corn meal)? Hi Rachelle! That’s dry polenta. Thanks for asking! I’ll edit my ingredients. Polenta sounds perfect in here Coleen! What a roster of recipes!!!!! I am impressed.